Iceland, the UK supermarket chain, is launching a frozen food board game, the Bushtucker Trial Game. Its release in November is scheduled just ahead of the newest season of I’m a Celebrity Get Me Out Of Here, which Iceland is sponsoring on ITV. 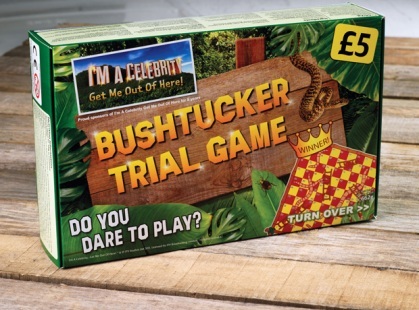 The Bushtucker Trial Game is a variant of Snakes & Ladders with special rewards and penalties. Imitating the part of the reality TV show where celebrities are asked to eat strange things, the game includes frozen, sanitized versions of snot balls, grubs, and worms (cream puffs with sour lemon filling, spinach-filled gnocchi, and fish surimi, respectively). 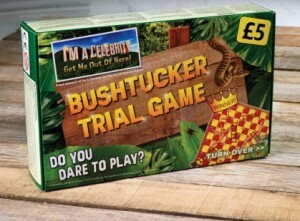 The Bushtucker Trial Game will be available November 10th in Iceland’s freezers for £5.